As we set off for our visit to Boone Hall Plantation outside of Charleston this week, there was an inner conflict on what to expect. On the one hand, we were both dreaming about the gorgeous Oak-tree filled grounds of the plantation where The Notebook and North and South were filmed. We imagined life on the plantation, sitting on the front porch of the grand house drinking ice tea or lemonade, gossiping about neighboring landowners and cooled by the South Carolina summer breeze. However, not a moment passed without a deep sadness as we explored the plantation. The reality of life on a plantation for the majority of its inhabitants is just too hard to ignore. There were over 4 million slaves in the south by the mid 19th century, over 300 at Boone Hall alone. How could people have bought and sold other people and built wealth upon the profits of their labor? And what do we do today that, in 150 years, could be perceived with the same level of disbelief? 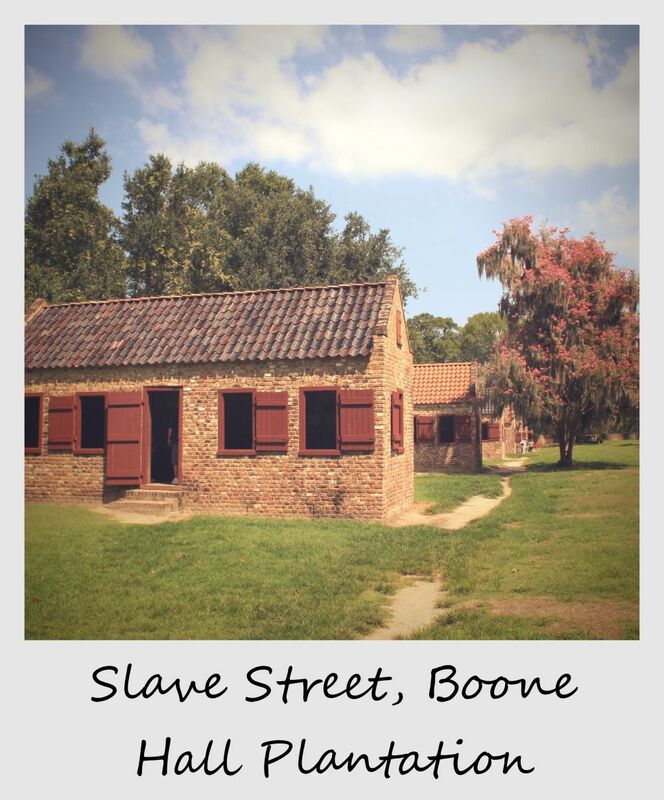 Here at Boone Hall, nine remaining brick slave cabins (the only left in the US) are lined along what is called Slave Street. The plantation does an incredible job in each of the nine cabins to represent through still images, audio, life-size mannequins and film what the life and culture of slaves and later sharecroppers in South Carolina. Most interesting was learning all about Gullah culture, essentially the mega-mix of cultures and language among the African-American population of the Charleston area. So glad you were able to visit a plantation while you were there! Yes, absolutely! We had planned to also visit Magnolia Plantation, but we ran out of time 🙁 Boone Hall Plantation was great though. Coincidentally I visited the Mel Fisher Museum in Key West. Saw alot on shipping of slaves to the US and other artifacts as well. The average life expectancy after capture and working on the plantation was 8 years-quite distressing. Interesting architecture. At least these slaves had brick buildings and not wood shacks, maybe they were able to keep a bit warmer in the cold months. Hey Karen – distressing doesn’t even begin to describe it. It’s just so hard to get our heads around how this implicit agreement between the people and slave owners worked. It’s awful to think about, but also important to see these places with our own two eyes, you know? They had brick shacks only because the plantation focused on brick making in the 1800s. A life expectancy of eight years is so upsetting….in this sense, times have certainly changed, no? At least we can say that…. Yes, there is always that inner conflict, as you mention, when touring some of the South’s big plantations. Coincidentally, many of the tours I’ve been to in Louisiana are conducted by African Americans. I’m not sure how many non-tourist slave homes still exist, but I know a guy in Baton Rouge, LA whose great grandfather owned a 2000 acre plantation. The family still owns it and harvests sugar cane. They still have what they call the “Quarters” adjacent to their land, as in the “Slave Quarters” – the land was originally part of the plantation, and the homes were later given to the freed slaves. The Quarters still exist and are private homes now.